No account of the universe can be true unless that account leaves it possible for our thinking to be a real insight. A theory which explained everything else in the whole universe but which made it impossible to believe that our thinking was valid, would be utterly out of court. As I discussed in Does Matter Exist?, the pervasive modern assumption is that we are complex biological machines and that our spirit is merely an emergent phenomenon of the complex arrangement of atoms in our brain. The most profound problem with this was the subject of Does Matter Exist, but the problems do not stop there. Perhaps the next most significant problem faced by the materialist is how to reconcile asserting that anything is true with the assertion that we, the seekers after truth, are merely complex biological machines. To understand the problem, imagine picking up a handful of stones and then scattering them on the ground. Is the resultant arrangement of stones true or false? Of course this is a nonsense question. The arrangement of stones is neither true nor false, it just exits, it just is. What if, instead of scattering the stones randomly, you arranged the stones in a ordered pattern that looked like “2 + 2 = 4,” would this arrangement of stones be true or false? In this case, the answer is more complex. On the one hand, this arrangement of physical things is still just an arrangement of physical things and, like the randomly scattered stones, is neither true nor false, it too just is. So, the physical arrangement of stones in the pattern “2 + 2 = 4,” qua physical arrangement of things, is no more true or false then the physical arrangement of stones scattered randomly. On the other hand, what is true about this arrangement of stones is the non-physical idea that you, the seeker after truth, associate with the pattern “2 + 2 = 4.” Without you, without the non-physical idea produced by the pattern of stones, the physical arrangement of stones in the pattern “2 + 2 = 4” just is. The crucial point is that it is the non-physical idea that is true, not the physical arrangement of stones. What if, instead of an arrangement of stones, we considered a modern computer which is an arrangement of physical things many orders of magnitude more complex; could a computer qua arrangement of physical things ever be true or false? Does the increased complexity make any fundamental difference? To answer this question, it is helpful to image a succession of computers each of increasing complexity. Initially you might start by considering an abacus, then perhaps a mechanical adding machine, from there you might consider electro-mechanical computers, then one of the first tube-based electronic computers, etc. Is there a point at which a computer changes from being merely a physical arrangement of things, which can neither be true nor false, to being an arrangement of things that can be true or false? The inescapable answer is that complexity makes no difference. An abacus is certainly just a physical arrangement of things, so is a mechanical adding machine, and so forth with each computer of increasing complexity. Furthermore, this would remain true as we continue to produce more and more complex computers. At no point does the computer change fundamentally. A computer 100 years from now will be as much a physical thing, as much merely an arrangement of physical parts, as an abacus or a pocket calculator. In a very real sense, it will merely be an enormous number of pocket calculators, miniaturized, connected together, and put into a single box. 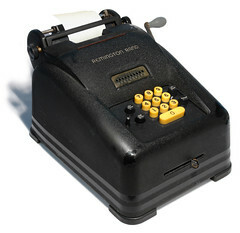 If a pocket calculator is merely a physical thing that can be neither true nor false, stuffing trillions of pocket calculators into a single box does not change this fundamental fact. An arrangement of physical things is just an arrangement of physical things, it does not matter whether the arrangement of physical things is a handful of stones scattered on the ground, the parts of a computer, or even all of the atoms in the universe. A physical arrangement of things merely exists, merely is. You can never point to a physical arrangement of things and say that the physical arrangement, qua physical arrangement of things, is either true or false. By now you have probably guessed where my argument is leading; namely, the human brain. If all that exists is physical, then we are nothing more than a complex biological machine and our brain is essentially a biological computer. We have seen that while a modern computer is many orders of magnitude more complex than a mechanical adding machine, this additional complexity does not make a computer different in kind from the adding machine, or even from an arrangement of stones. Thus, this additional complexity changes nothing with respect to deciding whether a computer, qua arrangement of physical things, is true or false. While the human brain is many orders of magnitude more complex than even the most advanced computer, the very same arguments we used to show there is no difference in kind between an arrangement of stones and a complex computer are equally valid to show there is no difference in kind between an arrangement of stones and the human brain. At the risk of repeating myself ad nauseam, complexity does not change the fact that the human brain is an arrangement of physical things, and as an arrangement of physical things, a human brain state cannot be true or false, it just is. How do the materialists reconcile this contradiction? The answer is remarkably simple, they wave their magic wand of “complexity.” Instead of addressing this fundamental problem directly, they wax eloquently about the amazing complexity of the human brain and how extraordinary it is that the phenomenon of thought can “emerge” from this complexity. But, just like a good magician they have deceived us—and perhaps even themselves—by using the intellectual fog generated by their discussion of complexity to distract our attention as the they pull the rabbit of thought out of thin air. You must not miss the fact that in none of their arguments do they answer the fundamental question; namely, how is an arrangement of atoms in our brain different in kind from an arrangement of stones? Saying that thought emerges from complexity is not an explanation, it is simply an unsupported statement. Of course the materialist has to leave room for truth which why he claims that thought emerges from the physical system of our brain, but the only reason he has for claiming this is because his belief in materialism demands it, and thus his argument is circular. Keeping our direct experiential knowledge of thought in mind, knowledge which is more immediate and thus more certain to us than any physical thing, the most obvious conclusion is that no purely physical thing, including our own brain, can be true or false, only a non-physical idea can be true or false. In Does Matter Exist we saw that materialism would have us deny that which is most certain, our spiritual nature, based upon that which is less certain, our perceptions of the physical world. Now we see that materialism leads us to have to deny the very existence of truth. If the physical world is all that exists, then it makes no sense to speak of anything being true or false. Everything that has ever existed or ever will exist, including human brain states, merely exits, merely is. In the materialist world, there is no room for truth. 1. ^ Lewis, C.S. Miracles. New York: Macmillan, 1978. 14. Print.